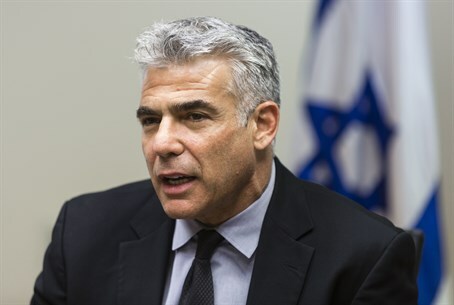 Finance Minister Yair Lapid (Yesh Atid) on Tuesday strongly condemned the committee appointed by the United Nations (UN) to investigate Israeli "war crimes" allegations in Operation Protective Edge in Gaza. Speaking on Channel 2, Lapid termed it "a ridiculous committee of ridiculous commissionership, that instead of investigating the murder of millions of Muslims by other Muslims, investigates the most moral army on the planet; this is a disgrace for the UN." Israel and the US have both rejected the three-man panel appointed by the UN Human Rights Council (UNHRC), which is headed by Prof. William Schabas, a Canadian law professor known for his bias against Israel. Schabas on Monday rejected the charges of bias, despite having once suggested in a speech that he believes Prime Minister Binyamin Netanyahu should be "in the dock of an international court." Regarding the ongoing truce talks with Hamas in Cairo, which are being conducted during a 72-hour ceasefire that began on Sunday at midnight, Lapid indicated that things could go either way. "It certainly could be that tomorrow at midnight the fighting will start again, and it won't be the same fighting, because we will strike much harder," warned Lapid. "This is an attempt to gain quiet for residents of the south, and all options are on the table - Operation Protective Edge isn't over." The finance minister pledged that "until we achieve their security we won't stop." Lapid's statements come after Netanyahu met privately with Lapid and other party chairperson coalition members Tuesday, in what one minister called "softening talks" to apparently try and convince them to accept concessions to Hamas. Reports have indicated these concessions would include Israel paying the salaries of Hamas officials in Gaza, easing the borders of the terror enclave and sending in building materials under inspection. Hamas has clarified that even if a truce is reached, it would only be so as to prepare the next terror war on Israel.